Lee Seung Gi�revealed a secret of Super Junior's Heechul. On the April 21 broadcast of JTBC's 'Knowing Brothers', Lee Seung Gi finally made his guest appearance, providing much laughter to the viewers as well as the cast members. During the Q&A segment of the show, Lee Seung Gi proposed the question, "What Heechul's secret did I learn of while in the military?" After many guesses, Min Kyung Hoon correctly guessed the answer, which was that Heechul used to cry frequently. 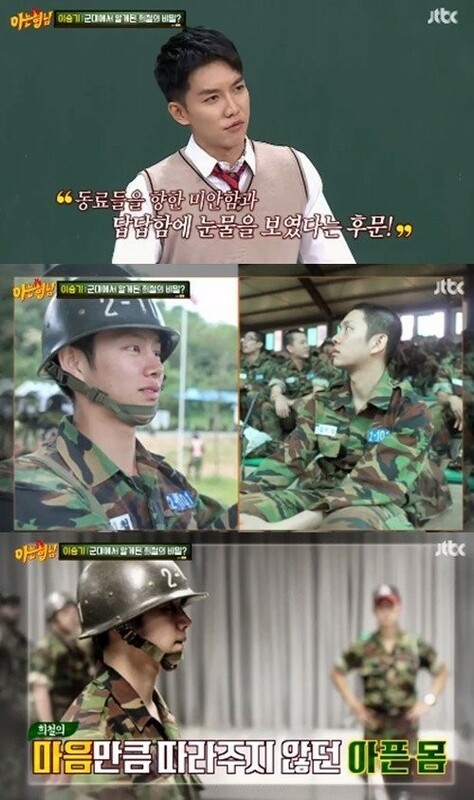 Heechul explained, "Of course at the time, I served as public service worker because of my health but I really hated how people said celebrities avoid military service, etc. and so, I did everything based on FM (Field Manual) during my�training." Despite his strong effort and doing everything as written in the manual, due to his leg injury from years back, he couldn't perform to the level he wanted to which made him upset back then. Have you ever felt the same way of feeling frustrated or upset because something uncontrollable was blocking your path?